Hillsborough Township Committee, along with the Board of Fire Commissioners, would like to recognize the Top 10 Responders from each Fire Company for 2018. 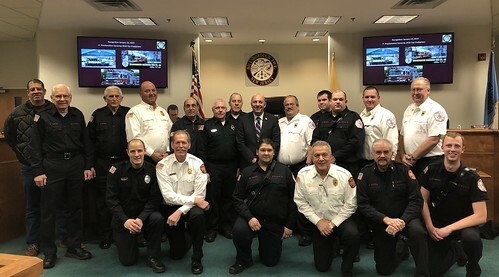 The Top Responders serve as examples of the Highest Standards of the Hillsborough Township Fire Companies through their heroism and willingness to help others. The Top 10 Responders of Fire Company 3, Woods Road are Kenneth Wetzel, Rick Artz, Manfred Nowacki, Edward Kovach, Michael Murphy, Ken Johnson, Timothy Coyle, Charles Nuara, Andrew Santos, and Alex Nagy. The Hillsborough Township Committee do hereby extend our sincere congratulations and appreciation to the 2018 Top 10 Responders for their continued heroism, commitment to the residents of Hillsborough and for being shining members of our community.